Living Hope Ministries. Building the UK & Overseas church. On 19 October, we will be celebrating 25 years of Living Hope Ministries. Please pray with us as we count down to this very special milestone. People preparing for Baptism in Liberia. Richard had the privilege of bringing teaching to Emmanuel’s church on believers' baptism. Living Hope Ministries is the work of Richard and Elaine Brunton. The work began in response to the call of God following a trip to Africa in 1994. As a result, they began this ministry to build the church through equipping and supporting pastors and leaders, both in the UK and overseas. Today, Living Hope consists of a team of people in the UK and various other countries. 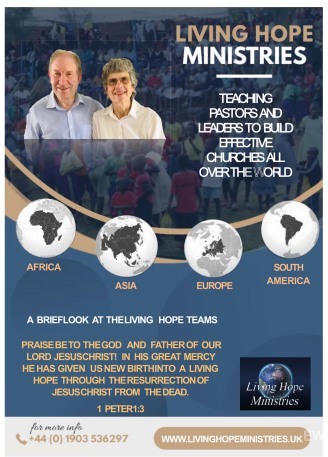 Living Hope Ministries continues building the church in the UK and overseas. This is through prayer, visits and website resources, etc. On this website you will find Radio Programmes and Bible studies in various languages. We pray that you will use these and be greatly blessed. We pray that God's purposes will be fulfilled, and that His guidance will be followed. Support is greatly appreciated, through prayer and finance. One of the many things Living Hope Ministries do is make bibles available. Please stand with us as we seek to build the Church of Jesus in some of the needier parts of the world. If you would like to help, or would like more information, please email us by clicking on the contact link.